A receipt with a line provided for the addition of a tip. Photo by Evan E. Duran. It was 5 a.m. and I couldn’t sleep. The wife wasn’t sleeping well either, and we both felt like we could eat a cow. We decided that an early morning breakfast at IHOP would have to suffice. As we arrived inside the restaurant, we quickly noticed there was no one at the front. We waited, and shortly thereafter were seated by a bubbly young woman who politely explained to us that she was the manager and that her server hadn’t shown up that Friday morning. She was all by herself, but provided excellent service. She brought us our food promptly, kept our drink cups filled and even asked what we had planned for the day, all while helping two or three other couples, and stopping every once in a while to leave a message on her absent server’s voice mail. When we left, we gave her a tip because she did a wonderful job providing us with extraordinary service, despite being alone. In this type of case, giving a tip is a no-brainer. But what about the everyday run-of-the-mill service that a food service employee is supposed to provide as a requirement of their job? Is a tip always necessary in these cases? For me, the answer is no. It seems to me that in the United States, society feels that giving tips to food service employees should be a requirement or is, in most cases, the right thing to do. Of course, if servers go out of their way to help their customer, it’s a nice gesture to give a tip. What bothers me are the waiters and waitresses that feel entitled to them regardless of the job they do. 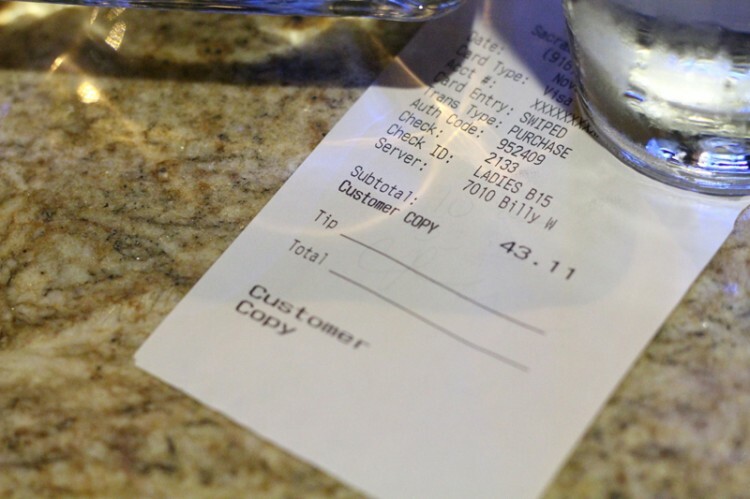 There are even some restaurants that automatically calculate the tip and add it to the bill when the price reaches a certain point. If I were to ever find myself at one of these establishments, I would laugh in the server’s face and refuse to pay the tip. People seem to not realize that giving a tip is the choice of the patron. A recent picture posted on www.reddit.com showed a receipt from an unnamed restaurant where a woman’s bill was approximately $140. The woman decided not to leave a tip, and instead wrote down a lame excuse that she’s a single mother and can’t afford to tip. She also wrote that the service was great. Now, I’m not arguing that she was in the right in terms of her silly excuse or the fact that if a single mom can afford to spend $140 on one single meal, she should be able to afford a tip of a couple dollars. However, I do feel it was her right and more importantly, her choice whether or not to leave a tip. I would advise her next time just to thank the servers for their service verbally and not write down a worthless excuse. This isn’t what got me fired up though. What prompted me to share my feelings was that the receipt was posted online by an angry employee who felt the woman should have given him or her a tip. It’s this kind of entitlement that bugs me. Upon speaking with some friends and family online, I was annoyed to see that most people agreed with the server. I understand the bill was higher than a typical bill at a restaurant tends to be, and I also understand that food service employees are paid less than minimum wage in most cases and that these employees tend to rely on their tips to pay their bills, but that isn’t my problem. If you don’t make enough money as a food server, here’s a tip: get a different job. I work in retail and go out of my way to help customers all the time, but my employer has a strict rule that we are not allowed to accept any kind of tips. Why should it be any different? When I go to a sit-down food establishment, I expect to be greeted at the door, seated, my order taken, my food brought to me promptly and my drink cup kept full. I shouldn’t be expected to pay extra for this service. Not to mention that places like IHOP charge around $10 for an egg, hash browns, two slices of bacon and a piece of toast. They charge extra for a drink. Judging by the quality of the food and the amount served, the price of the basic service is included in the price of the meal. Then there’s the fact that many of these restaurants have basically become only slightly better than fast food joints. Take Denny’s for example. My wife and I can eat a meal there for about $23. We pay around $16 at a place like Taco Bell or Burger King. The extra cost, to me, pays for the service. I still get my order taken, am given a place to sit down, and my food is still cooked for me at the fast food place, so really I’m paying an extra $7 to have my food brought to me and my cup refilled, a service that some fast food places even offer. If I eat at Home Town Buffet, I pay even more and I have to go and get my own food. In the end, it’s not that I can’t afford a $2 to $3 tip; it’s the principle of the whole thing. Giving a tip should only be prompted for exceptional service. I’m also not one to do something just because society says I should. If a waiter or waitress does not go outside the realm of what I call normal service, I don’t tip. This entry was posted in Opinion, Sac City Express (SCC) and tagged Denny's, dollars, drink, establishment, excuse, Home Town Buffett, IHOP, minimum wage, paying, receipt, service, tips, United States, waiters, waitresses. Bookmark the permalink.